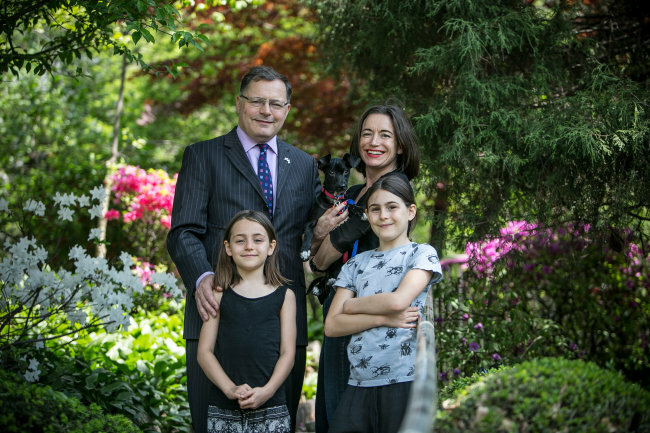 Caspian was among 55 canines salvaged from a dog meat farm in Goyang, Gyeonggi Province, in January 2016 by the Humane Society International, an organization dedicated to animal well-being. 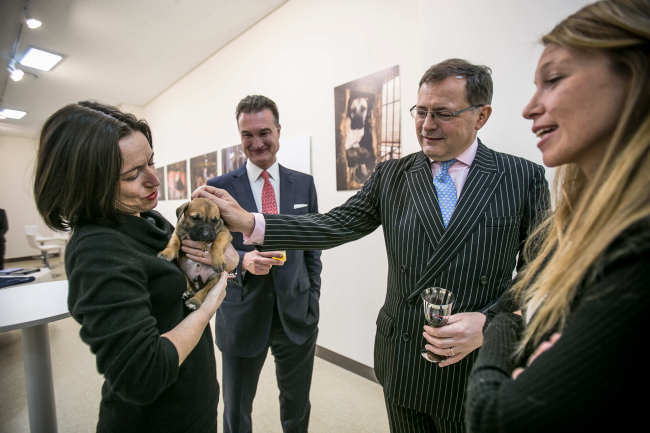 The event, organized by HSI and sponsored by the embassy, was attended by Robin Russell, an international environmentalist and businessman who has worked extensively on conservation issues and championed the partnership of corporate philanthropy and environmental campaigns in the UK. “These photos show powerful transformations of the rescued dogs, and highlight that these creatures need, demand and deserve to be treated as the sentient beings that they are. I felt a deep and profound sadness when I arrived at the farm this morning on my first visit to Korea. The sadness turned into anger and by the end of the day, hope,” Russell said in a speech. The HSI, founded in 1991, works around the world to alleviate the suffering of animals. It targets inhumane practices affecting companion and farm animals, the illegal wildlife trade, threats to endangered species, the slaughter of marine mammals and the use of animals in medical research and testing. It has worked with governments, humane organizations and animal protection workers to find solutions to these problems and spread a culture of compassion for all forms of life. 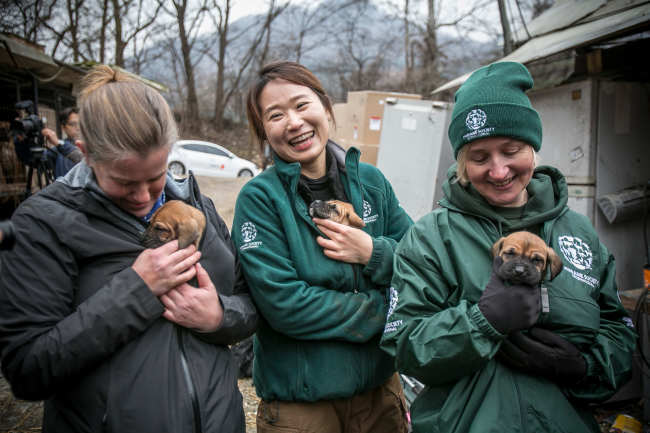 Since 2014, the society has saved over 1,220 dogs and closed 10 dog farms in Korea through 10 rescue missions. The rescued dogs are then given medical treatment and flown overseas to be adopted as pets, primarily in the United States, Canada and the UK. The HSI said that all breeds of dogs can be found in the country’s dog farming industry, including popular pure breeds such as golden retrievers, spaniels and Chihuahuas, as well as the native Jindo, Tosa and Yellow Dog breeds. 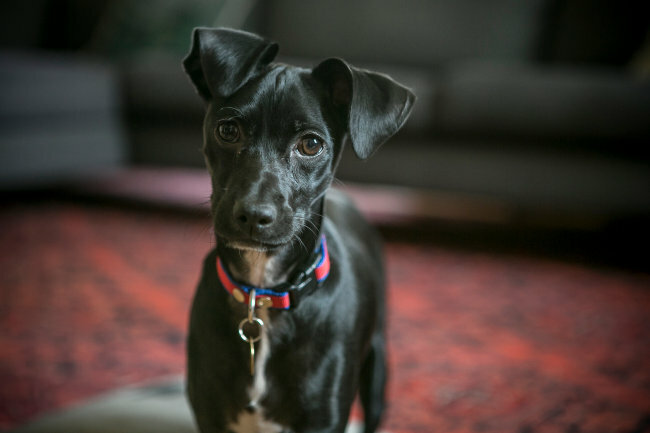 In some cases, stolen or abandoned pet dogs have been found in dog farms, still wearing their collars. The dogs live inside cramped, unhygienic cages and are exposed to the weather, causing pain, trauma, skin diseases and malnutrition. 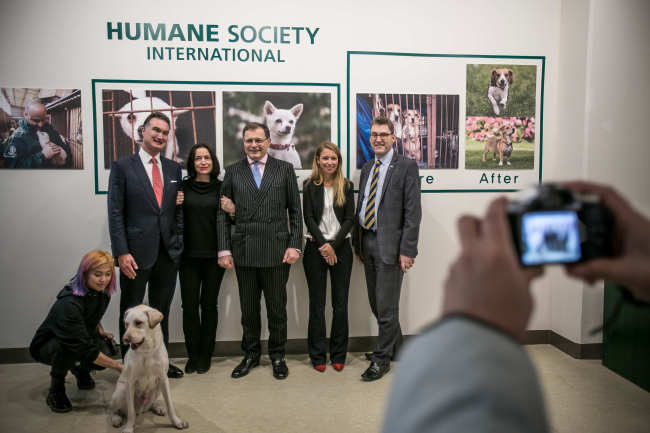 A central pillar of the HSI’s work in Korea is to work with dog meat farmers to permanently close their business and switch to alternative livelihoods such as arable agriculture. Dog meat farming has also become less profitable owing to falling demand, as the meat has attracted a stigma and younger generations increasingly avoid it. Although eating dog is widespread across Asia -- in China, the Philippines, Indonesia, Thailand, Laos, Vietnam and Cambodia -- Korea is the only country to have industrialized the trade, according to HSI, and slaughters an estimated 2.5 million dogs annually. 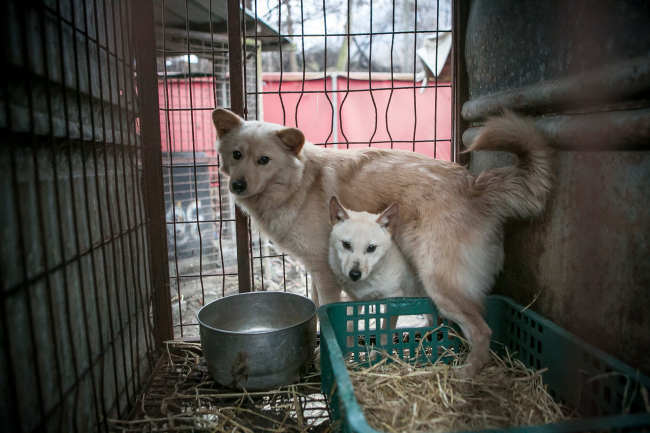 There are an estimated 17,000 dog farms across South Korea that supply dog meat restaurants with meat or live animals. The meat is most popular with the over-60s, especially men, who savor spicy dog meat soup known as boshintang. Dog eaters think that boshintang gives them virility and energy, in contrast to medical advice cautioning against it, as the meat has often been contaminated with antibiotics, drugs and unsanitary elements from their food. In many cases, the dogs are killed to produce gaesoju, or dog tonic, a medicinal broth strained from dog meat and cooked with herbs. The dog meat trade here exists in a legal limbo, with Article 7 of the Animal Protection Act allowing the slaughter of dogs for consumption but prohibiting the killing of animals using brutal methods -- provisions that are routinely flouted by the industry. “The PyeongChang Olympics and Paralympics are supposed to symbolize humanity and new horizons, so they offer the perfect backdrop for South Korea to finally address the terrible suffering of the dogs and put an end to the industry,” Wendy Higgins, director of international media at the HSI UK, told The Korea Herald. The recent decision by Korean President Moon Jae-in to adopt a dog rescued from a dog farm, Tory, as well as his pledge to improve animal welfare, should be catalyzed upon by the Korean government and public, the society urged.